For years, Corning’s Gorilla Glass has been touted as the toughest of tough glass for smartphone screens. 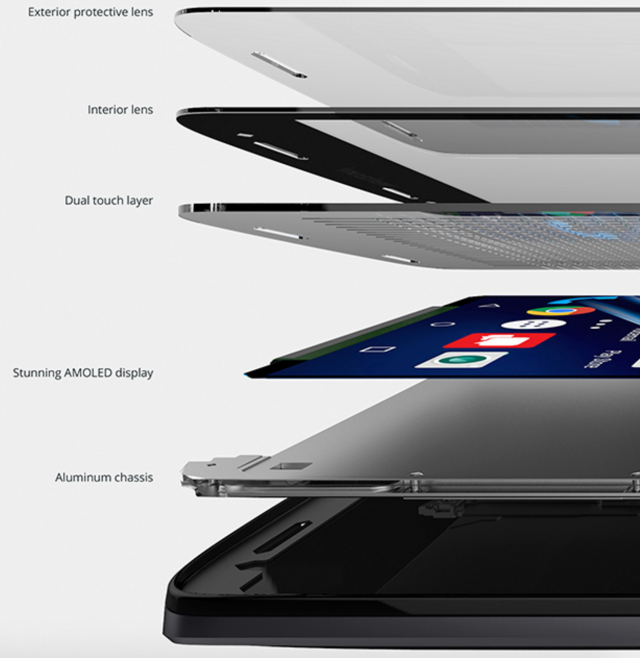 But what if your smartphone screen didn’t need to be glass at all? That’s the point Motorola challenges with the Motorola DROID Turbo 2 for Verizon. The thing is shatterproof. How do I know? Because at today’s announcement in NYC, I watched Motorola’s Rick Osterloh hold the device shoulder high and drop it directly on the solid ground. Twice. That’s not something you do unless you’re confident it will undoubtedly, 100% pass the test with flying colors. It did… and then we took a closer look at what makes it work. 1. Exterior Protective Lens – a protective layer with a proprietary hardcoat designed to guard against dents and abrasion. 2. Interior Lens – highly transparent layer that provides a clear protective shield that won’t crack or shatter. 3. Dual touch layer – in the event of an impact that damages the primary touch-sensitive layer, a second layer takes over to maintain touchscreen performance. 4. AMOLED display -flexible display that absorbs shock and provides amazing picture quality. 5. Aluminum chassis – a rigid aluminum chassis provides structural integrity and durability. Yes, you read that right: the Turbo 2 basically has two touchscreens so that if one breaks in a fall the second one kicks in and takes over. Motorola is standing by their statement, too, offering a 4-year warranty on the screen (you’ll want to read the fine print). All-in-all, pretty amazing stuff. It’s just a shame that they’re only bringing the device to Verizon Wireless. Hopefully will see Motorola ShatterShield in other Android devices soon.